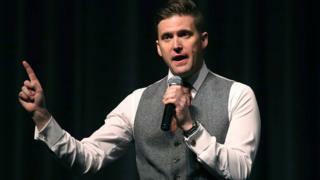 Image caption Richard Spencer popularised the term "alt-right"
The wife of US white nationalist Richard Spencer has accused him of being "physically, verbally and emotionally abusive", US media report. She said that in 2014 he again "attacked" her when she was four-months pregnant. Richard Spencer is a figurehead for US far-right groups and popularised the term "alternative right". Ms Koupriianova's divorce papers were filed in a Montana Court in June but were first reported by Buzzfeed News on Tuesday. According to the report, Ms Koupriianova's lawyers said she had been "reluctant to call police or seek an order of protection for fear of further reprisal". "Much of the abuse has occurred in the presence of the parties' children," the court documents said. Speaking to the Associated Press news agency on Tuesday, Mr Spencer said he was "not an abusive person" and that his wife was "never in a dangerous situation". Richard Spencer first rose to prominence when he led chants of "Hail Trump" to a Nazi-saluting group in Washington after the US president's election victory.